John Robert Philip was born on 18 January 1927 in Melbourne, Victoria, Australia. His father, Percy, was a farmer from Franklinford, near Castlemaine in Victoria, who moved to Foster after his marriage and became a stock and dairy inspector. John’s mother Ruth (nÃ©e Osborne) was a schoolteacher and a Methodist lay preacher who had a deep commitment to education and very high expectations for John and his younger brother, Graeme. Under his mother’s influence, he developed a precocious mathematical talent and he won an open scholarship to Scotch College in Melbourne at the early age of eleven. The family then moved to Carnegie on the outskirts of Melbourne so that John could attend Scotch as a day boy. At the age of twelve, John demonstrated his independence by walking out of an evangelical service when asked to promise his life to Christ. Frances (Fay) Julia Long from the girls’ side of the assembly was his sole fellow dissident. They were married ten years later. At Scotch College, John was placed in a class where he was almost three years younger than his fellow students and where his intellectual world expanded enormously. He also discovered that his English teacher would accept poetry in place of an essay; his lifelong love of poetry was born, he said, from his discovery that poetry brought the greatest results for the least effort. He matriculated at 13 and spent a further two years studying ‘leaving Honours’ before he could enter the University of Melbourne. John said later that mathematics was his favourite subject at Scotch although he was not identified as exceptionally talented. This was probably because, in his class of six students, RH Dalitz, AK Head and John himself became Fellows of the Royal Society, JB Swan and SN Milford became professors of physics and ND Symonds became a biophysicist who later worked with Max DelbrÃ¼ck and Erwin SchrÃ¶dinger. John entered Queen’s College in the University of Melbourne in 1943 and graduated BEng in 1946. At 19 years of age, he was, and remains, the youngest Civil Engineer ever to graduate from the University of Melbourne. When he graduated, John was too young to be paid the Victorian Public Service Engineer’s adult wage but the University, for the first time ever, advertised for a graduate assistant in agricultural engineering at adult rates. He was appointed and seconded to the CSIR Irrigation Research Station at Griffith, New South Wales. faced with an almost entire lack of basic information and exhibited considerable intelligence and aptitude in handling irrigation problems. He is apt to be a little untidy in his appearance. This may be the result of his hobby, which is writing poetry and his tendency toward a certain Bohemian outlook in his private life. This in no way affects his work which is technically of a high standard. Lang was referring to John’s link, through the magazine Barjai, to Brisbane bohemia, including the artist Charles Blackman, the poets Barrie Reid and Vida Horn, and Charles Osborne, now a London music critic and writer. John’s intellectual associations in Deniliquin were strengthened in 1956 by the appointment of Dan de Vries to Deniliquin. Dan had just completed his doctorate at Leiden based on research in the physics laboratory of what is now Wageningen University and his strong physical sciences background, his enthusiasm to apply physics to real-world problems and his sound experimental skills complemented and extended John’s horizons. John Philip’s Deniliquin years were enormously productive and from 1953 until 1960 he published more than forty scientific papers, although his work habits, as in his undergraduate days, still varied between periods of intense activity when he often worked all night and periods when he was a quite disruptive influence in the laboratory. Nevertheless, he was gaining an international reputation. His interests ranged from population dynamics to heat and mass transfer in the biosphere, and a scan of his first ten years of publications reveals how catholic his commitments were. In 1956, he visited Dr EC Childs at the Agricultural Research Council Unit of Soil Physics in Cambridge and a couple of years later had a brief visit to the California Institute of Technology which resulted in an effusive letter from Professor James Bonner to Otto Frankel with an invitation for John to spend sabbatical leave at Caltech. The responses to these visits confirmed for CSIRO that, while John had a difficult personality, he was very able and an asset to be nurtured. Otto Frankel therefore agreed that, on their return from Caltech, the Philip family should move to Canberra where John would establish an Agricultural Physics Section in the Division of Plant Industry. Following Otto Frankel’s advice to forgo a PhD, John took a DSc (physics) from the University of Melbourne in 1959 for an extraordinary set of eight papers that brought unity to the existing approaches to water movement in soil. John’s reputation, as a very able young man in a hurry, was growing. In 1963, when John Falk succeeded Otto Frankel as Chief of the Division of Plant Industry, John became one of his four Assistant Chiefs. In 1969, when John Falk became very ill, John became Acting Chief of Division. In 1971, however, Lloyd Evans was appointed substantive Chief and John became Chief of a new, small and autonomous Division of Environmental Mechanics. The new Division’s objectives emerged from those of the Agricultural Physics Section and sought to link laboratory experiments with field behaviour and to develop practical mathematical descriptions of environmental processes. The Division was created about three small groups set up to investigate and bring together the components of the soil-plant-atmosphere continuum that was conceived by Gradmann and van der Honert to unify the terrestrial hydrological cycle. This concept recognised that water in the soil, the plant and the atmosphere forms a thermodynamic continuum. Water flows from one domain to the next along gradients of water potential, so its flow could be analysed in a mathematical-physical framework. Coupled with the concept of a critical water potential at which plants lose turgor and stomata begin to close, the analysis could be used to predict how the properties of each domain controlled transpiration and water extraction by plants and the onset of wilting. A fourth group, called Applied Mechanics, which John himself led, provided theory complementing the three more experimental groups. John insisted on scientific quality and his support for a series of very distinguished Pye Fellows ensured that Environmental Mechanics was recognised internationally as a centre of excellence. Except for a three-year period as Director of the CSIRO Institute of Physical Sciences, John was Chief until his retirement in 1992. 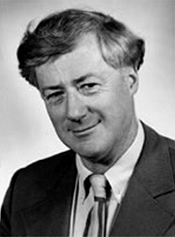 His three years as Foundation Director of the CSIRO Institute of Physical Sciences from 1979 were energetic and idealistic and Institute meetings were wonderful forums for interdisciplinary discussion among ten Divisional Chiefs of wide-ranging persuasion. John’s aspirations, based on scientific quality, were evident in the four major divisional reviews he conducted, although his impatience with so-called Standards measurement raised disquiet among staff who felt that he did not understand the challenge of fine measurement. His aspirations were also challenged by the ambitions of fellow Directors and some Chiefs who did not share his vision for CSIRO as set out in the Task Force Report. The ultimate factor, which he deplored, arose, however, from political pressure to use ‘external income’ as a measure of scientific achievement and for CSIRO thence to operate, as former Minister for Science Barry Jones put it, ‘like an upbeat panel-beating shop’. Following his retirement he became the first CSIRO Fellow Emeritus. His retirement saw no diminution in his research. He continued to collaborate internationally and delivered his last paper in Amsterdam, two days before his death. Modern theories of mass and energy movement in the biosphere, focused on water, were generally accepted by the mid-twentieth century. They tended to be reductionist in character and flow equations combined macroscopic material, force and energy-balance equations with flux laws based on space gradients of potential. These equations were difficult to solve because the transfer coefficients tended to be strongly related to the local concentration of the entity of concern, the location, or both. The architecture of the crop canopy and the root system complicated their formulation as well as the scale of their application and test. Nevertheless, their solutions were required to deal with important problems of land and water management and crop and forest production. When computers were in their infancy, John sought practical methods for description and measurement in each phase of the soil-plant-atmosphere continuum but his principal interest was in soil water and his initial focus in Deniliquin in 1951 was on border and furrow irrigation. John Philip was an enthusiastic traveller, a connoisseur of architecture, a catholic reader and a published poet. He loved cooking and eating and he was a charming host and vivacious dinner guest. He played chess with a computer, watched sport on television and admired and loved his cats. John Philip was struck by a car and killed on Saturday 26 June 1999 in Amsterdam where he was visiting the Centre for Mathematics and Information Science. He was a Fellow of the Royal Society, a Fellow of the Australian Academy of Science, a Fellow of the American Geophysical Union, a Foreign Member of the All-Union (later Russian) Academy of Agricultural Sciences, and only the second Australian Foreign Associate of the US National Academy of Engineering. He was the first non-American recipient of the Robert E. Horton Medal, the highest award for hydrology of the American Geophysical Union. In 1998, he was made an Officer of the Order of Australia for ‘service to the science of hydrology, to scientific communication in promoting the interests of science for the community, and to Australian culture through architecture and literature’. This memoir discusses John Philip’s character and his work as Australia’s most distinguished environmental physicist. It explores his management of science and his role in the Australian Academy of Science as well as his poetry and his fascination with architecture. angular, indigestible, as at birth. John’s contributions to the Australian Academy of Science were energetic. He was proud of the distinction that his Fellowship was considered by four of the six Section Committees of the Academy; those of mathematical, physical, terrestrial and biological sciences. In Council meetings John’s contributions were wide-ranging, witty and irreverent in presentation but balanced in their recommendations. He was an activist Secretary (Biological Sciences) from 1974 to 1978, and played a major role in planning the intellectual (as opposed to the ceremonial) activities of the Academy’s 25th anniversary in 1978. As part of those activities, he introduced the symposium Science and the polity: Ideals, illusions and realities and contributed significantly to discussion of issues of scientific accountability and autonomy that featured in the Science Task Force report.